Y'all, it's cold here. It's cold in a lot of places, I know, including a lot of places people I know live. But still, it's worth commenting that it's cold here. This makes me all the happier that last night I finished off the hat I started Sunday evening. The knitting went super quickly, but there was a seam I didn't feel like dealing with until last night. Crappy picture, but cute, very warm hat. I was inspired by seeing this post over the weekend--I realized that I had some chunky alpaca yarn that I'd picked up a few years ago at the Estes Park wool market, and never figured out what do to with. And so, urchin, size medium, in Misti Alpaca Chunky, I think color "ember melange," though I've thought of it as ox-blood, on 7 mm needles. I only had double pointed needles in that size, so I stuck needle caps on ends and used those--there's only 22 stitches per row, so that's no problem. Most of all, since it's alpaca, even though it's got places where it looks a little loosely knit, it's quite warm. I wore it this morning and my head was toasty. Or as toasty as it's possible to be when the temperatures drop into, as I like to call them, snot-freezing temperatures. Sorry, I know that's gross, but it's also the best description there is, as far as I'm concerned. First, there was the snow. Lots of snow, all Sunday. Falling and blowing and generally being pretty and cold. 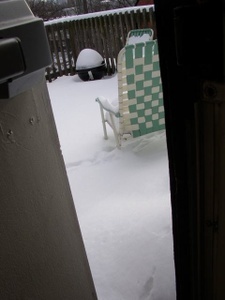 This is as far as my back door opens right now, so much snow is on my little deck. This would be less of a problem if my shovel weren't buried somewhere under the snow. Well, actually, first there was my mom coming to visit for the weekend. We ate a lot of good food, and did a bit of touristy traveling around by streetcar and subway (mostly the former, which allows for better tourist-being). While doing all this, I was very glad for my newly finished gloves. This is all based on some hand spun, hand dyed yarn I bought in Berlin. It was a thick and thin, fairly bulky yarn. First, I used just it and made a garter stitch scarf. I was careful not to make it too long, by instead making it what initially seemed a touch too short. But, of course, it stretched, and I am am very happy with the result. But I had extras. And so I put it together with some brown yarn I had around (I think it's a wool/yak/silk combination, so, fancy!) to make a matching hat. And then I STILL had extras. 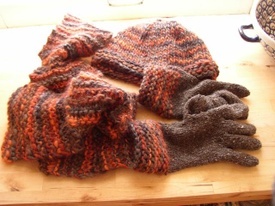 So I used it plus the brown for the cuffs, and then only the brown for the hands, of my first pair of gloves. They took several iterations of guess work to get them sized properly, and I should probably have done them one needle size down for a tighter fit. And I still haven't perfected the picking up of stitches to avoid holes completely, but I have now at least learned to leave long enough ends to sew any holes closed. 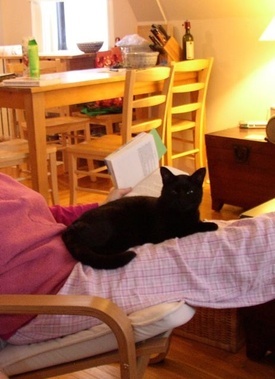 Ziti certainly enjoyed having another lap to sit in... and, actually, I think he prefers my mom's lap to mine! She thinks it's because when he was staying with them he got tastier food, and so he has residual memories of that. I think he just likes her. On Sunday, we totally never left the apartment. Well, I walked down to the front door twice, once to get the paper, and once to throw out some trash. Instead we read, and listened to music, and watched a FREAKY sort of silly, sort of scary show I'd recorded a couple months ago, Jekyll, which was enjoyable. And we made cookies. I've decided to give cookies to some people this year, and so baking was necessary. Here's a blurry picture of the results, pre packing into give-away boxes, due to the fact that I need to acquire more packing materials. 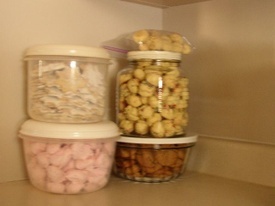 Those are (clockwise from top left) "Linzer stars," "Italian sprinkle cookies," "molasses crinkles," and "raspberry meringue kisses." They're all, if I do say so myself, yummy in very different ways. Oh, wait, we also knit. Mom started something over Thanksgiving, but a couple of inches in she found herself stopped by a mistake, and so put her project away until now. Now, how cool is this? I gave mom other, plainer wool and needles, and she set about purposefully making mistakes so she could learn how to fix them. And she's totally showing her math teacher roots. She wanted to know the difference between garter stitch and reverse stockinette, since initially it does look quite similar. I said, "well, the bumps are arranged differently." She paused for a few moments, and said, "oh, in one they're offset, and in the other they're right on top of each other." Yes, exactly! Pattern recognition, ahoy! and she went on knitting, and got quite a bit done. I'd post a picture, but she's looking at me like "why on earth are you taking a picture of me right now" in it, so... just trust me. There was much knitting. Now that I know that the babies involved have received these, and therefore that any parents of said babies who read this (not sure if any do, but you never know) know about them, I can post pictures of a few tiny projects that I made over the last couple of months, and then took forever to send to their new owners. I charted the little bees in Excel (that link downloads the excel file), and then had to figure out how to put them on the hats. I first thought I'd do them as a repeating pattern all the way around, doing a sort of stranded color work thing, but that got way too complicated, with too many things dangling off the back and too much twisting and confusion. 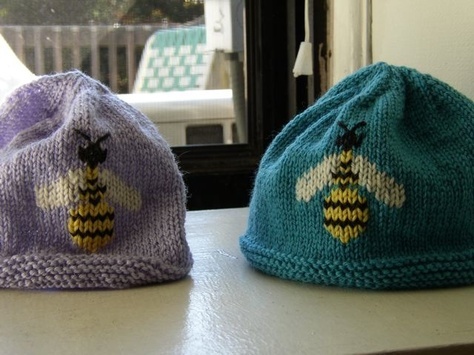 And so, instead, I just knit the hats plain, and then duplicate stitched the bees on top. Perfect solution! 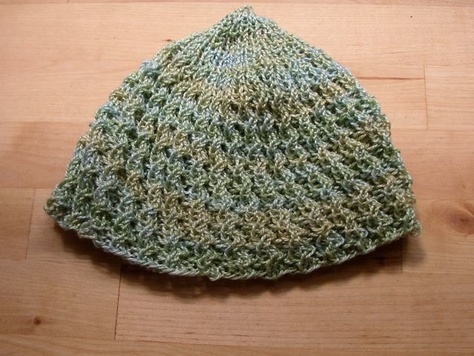 Second, a very simple little mock cable rib hat, in variegated fine cotton, for a SoCal baby. The cotton is the stuff I bought in New York last spring, that I used (with something else) to make the Milanese lace camisole/tank. I liked it then, and I like it now! I still have a ton of this stuff, too. 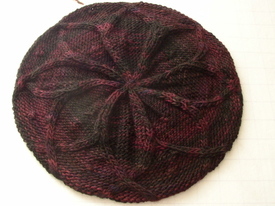 I finished desiknitter's rangoli hat two nights ago, and here it is blocking. This was a lovely quick knit. Best of all, I didn't have to switch from circulars to double pointed needles until maybe the last five or six rows. To that I say awesome. The yarn's stuff I bought in Melbourne last year, from Marta's Yarns. It's a nice wool, and I can't remember anything about it other than that (at Marta's the yarn's all on big cones, and they wind you off as much as you want; I got 100 g, and still have a small bit left over). It turns out that my bobble technique needs work. I don't think I did them very well, they kind of don't show up very much in real life, though I guess you can see them in this picture. I also ended up using a size 6 needle, because I was worried about the tightness of the ribbing on size 5s. Now, of course, seeing how the yarn relaxed when washed, I can tell that the 5s would probably have been fine. But. I worried. I must admit, however, that I'm not sure I'm going to like this hat on my head. In its unwashed, unblocked state, it looked goofy (on me, not generally! I have weird hat issues), but we'll see how it does now. I also just started something new with the alpaca that was going to be the frost flowers and leaves shawl. It's the Alpine Lace Scarf from Victorian Lace Today. This is the bottom border, and a single repeat of it will run up the sides. In the center will be a leafy pattern. 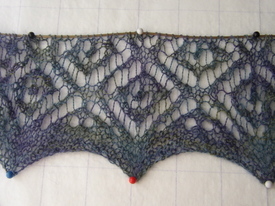 I'm liking it so far, though working on the Orenburg shawl ruined me a bit for other lace work. On Orenburgs, there's no purling. And that's a good thing, in general. I've been knitting quite a bit, despite the heat, in large part because I finally broke down and got cable. And in a fit of profligacy and desire, a dvr. So now I've got it recording all sorts of things (the Daily Show, Everwood, Farscape, Gilmore Girls, Slings & Arrows, Mad Men, and random movies that I've noticed) and have been very, very much enjoying this. It's letting me catch things I missed during the spring, too. Whee! And, yes, I'm getting real work done to. And even added to it, by agreeing to some additional service next week. Man, what am I thinking?! An anecdote: Vladimir Putin walks into the kitchen and opens the refrigerator, where he sees a gelatine. He tells it "stop trembling, I'm here for the cheese." A new (and sad) sighting: I've gotten sort of used to the stray dogs (though I will grant that the stray dog sleeping IN THE MIDDLE OF A METRO CAR was a bit surprising, and not really a good start to the day), sad as they are, but I think I've now actually seen stray cats fighting for dominance. Well, not fighting yet, but two cats were having a stand off--IN THE SNOW--in my neighborhood the other night when I was coming home. That was mildly surprising. And earlier that day, in an odd coincidence, I'd seen the archive cats for the first time this trip. One was yowling to be let into the office. He got his way. Thoughts on The Office, with which I am now caught up, thanks to the fast free wifi that came with my cappuccino yesterday: AUGH! Michael Scott has been enormously cringe-inducing over the last two episodes, just when it seemed like he was being sort of normally human for a while. MUCH more like the first season... and I actually even thought he LOOKED more like first season Michael Scott in the episode "Ben Franklin." I actually had to stop in the middle of that episode, because I couldn't bear the thought of where he might be going. 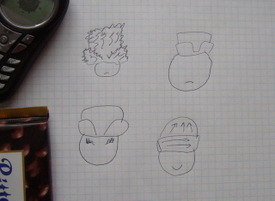 Thoughts on hats: this is a very, very sad attempt to capture some of the hats I've seen. I'm a little too shy, or something, to snap pictures of total strangers, even though there have been a lot of them that I'd like to capture. But they are examples of the GIANT fur hat on a tiny head, a too-small fur hat on a big head, a just-right hat on a head with Brezhnev eyebrows (seriously, they were amazing), and an attempt to express something I've found interesting about a lot of the knit hats I've seen here. First, most of them seem to be knit flat and then sewn up the back. Second, I've seen a lot in which the band is knit in a narrow strip, and then (I assume) stitches are picked up along one long edge and knit up for the main part of the hat. 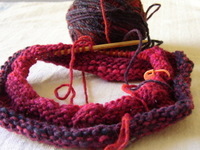 In other words, the direction of the knitting is different between the two parts. And there are a lot of hats with very wide bands, actually. And my favorite possibly hand-made hat I've seen was actually crocheted (or so it looked to my eye) kind of on the diagonal. It was very cool. And a first: a pattern to offer (a pdf file). It's the entrelac Mac envelope, also suitable as a bag in other ways. Add a handle. Add a button. Add a zipper. Go crazy! Anyway, the pattern may well be rife with mistakes. I totally just wrote it up from memory of what I did, not as I went. I think it's right, but if anyone happens to try to make it, and discovers there are major problems, let me know, and I'll fix them and repost. Some of the instructions (about amount of yarn and gauge, in particular, I'm afraid) are kind of vaguer than I'd like, and some are more rambling than is probably ideal, but... hopefully it makes sense. So, yes, this is a stranger than normal WsIP picture. But, hell, I was feeling arty. In front is the most recent thing I've started: a booga bag. Except mine will be bigger by about a half, I think. I've just finished the bottom, and will probably pick up the stitches to start working in the round when I finish this post. The yarn, incidentally, is Noro Kureyon #124, which I have to say is lovely. When I decided to order the Kureyon to make that hat, I ordered 5 skeins, because otherwise mail ordering would feel stupid. I first thought I'd make mittens and a scarf to go with the hat... but as pretty as the yarn is, it's awfully scratchy, which makes me less inclined to have it wrapped around my neck. So, I finished the hat and decided to use the rest for something else... hence, the booga bag. Yee haw. Behind it to the left is the yarn for the second sock... on which I've done very little. Like an inch of the ribbing, that's it. But it'll come. Then the Orenburg shawl. Enough about that already. 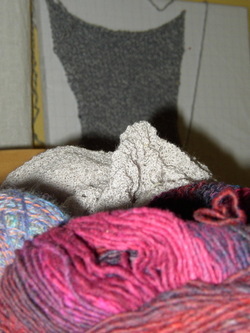 And finally, the giant grey thing looming in the back is the second sleeve of the pinwheel sweater, which has been laying there pinned to the blocking board for... a couple of weeks? Holy crap. Yeah, I should finish that. Completed this month, incidentally? One sock. One clapotis. And one hat. Seriously, I have not been this sick in years. And for this I am grateful, since I know that even if I've felt like crap for almost a week, it's still just having-a-bad-cold crap. Nonetheless. I'm tired of it. Despite the still being sick, I went to L's yesterday and caved and bought the very pretty, expensive yarn I've been coveting. It's her "Wuxi," which is 50% wool, 50% silk, and extraordinarily soft. For whatever reason, I just adored these colors, the dark, rich oranges and reds. Because of the silk, I think, the yarn has a nice luster... that's probably why the sunlight here, even if not direct, is washing the color out a bit. It's really made of a bunch of very rich tints, not pale at all. Now the thing is, I have no idea what I'll do with this. Something lovely, that I know, but what exactly? We'll see. 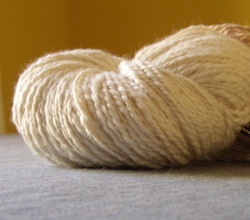 I also picked up something much more reasonable: basic cream organic cotton in a slightly nubbly twist. I don't have an exact pattern in mind, but basically, I could use a new spring/summer lightweight cardigan type thing. And this yarn will, I think, be perfect. It may actually be the thing I work on next. In the meantime, though, I've started to work on that Noro hat I linked to a few weeks ago, a stripey, ribbed sort of thing. I broke down and ordered some Noro Kureyon which is, for those of you who read this not for the knitting (if you read these parts) is a Japanese wool that is famous for its colors and the way it knits up. I think I read somewhere that it was one of the (or maybe the?) 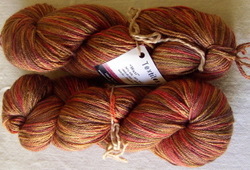 first self-striping yarns, which means it creates regular (more or less) stripes as you knit in the round. Anyway. I had much more of the hat done, but, eh. The pattern calls for more stitches cast on than I'd do, which is, I assume, to get the striping to work out well. But my striping wasn't coming out perfectly (though prettily), and it just seemed sillily big. So, instead, there's this much done, and the yarn balled which means it's harder to see its prettiness. It is pretty, I have to say, although it's also kind of scratchy, which makes me think I may not love this yarn.